RNA is an essential molecule in the flow of genetic information. It forms complicated secondary and tertiary structure to perform biological functions. Non-coding RNAs (eg. rRNAs, tRNAs and snRNAs) adopt very stable and specific secondary structures in splicing and translation processes. The secondary structure of mRNAs has also been found to play an important role in post-transcriptional and translational regulation. However, it is difficult to decode RNA secondary structure in vivo. 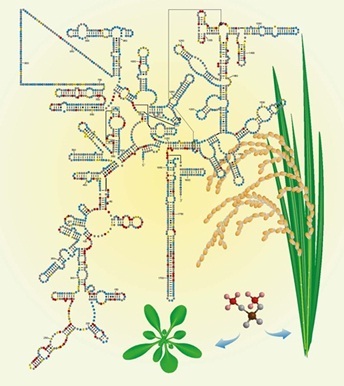 While functional genomics in rice have achieved many impressive improvements in recent years aiming for better evolutionary studies and rice production, the nature of RNA secondary structure in rice remains poorly understood. Recently, Dr. CAO Xiaofeng’s group at Institute of Genetics and Developmental Biology, Chinese Academy of Sciences, collaborated with Yiliang Ding’s group in John Innes Centre in the United Kingdom, decoded the first in vivo RNA structurome in rice. The researchers successfully established the Structure-seq method by dimethyl sulfate (DMS) in rice and generated libraries with high quality and depths for the first time. They found that several similar RNA structural features in rice appeared to impact multiple aspects of RNA function and processing, which is similar to those in Arabidopsis. Moreover, they found that RNAs with higher N6-methyladenosine (m6A) modification tends to have less RNA structure, especially in 3’UTR. Lastly, sequence identity and RNA secondary structure similarity comparison between rice and Arabidopsis revealed a weak correlation between them. Gene Ontology enrichment analyses implied that RNA structure evolves differently for various biological processes to maintain robustness in development and flexibility in adaptation during angiosperm evolution. Their study provided a separate layer of RNA structure-function analyses for understanding the gene function in addition to the traditional way of sequence-function analyses. This study has been published online in Molecular Plant entitled “Rice in vivo RNA structurome reveals RNA secondary structure conservation and divergence in plants” (DOI:10.1016/j.molp.2018.01.008). DENG Hongjing, a visiting PhD student in CAS-JIC Centre of Excellence for Plant and Microbial Science, is the first author. Dr. Yiliang Ding and Dr. CAO Xiaofeng are co-corresponding authors. This research was supported by Biotechnology and Biological Sciences Research Council (BBSRC) and University of Chinese Academy of Sciences (UCAS) Joint PhD Training Program.